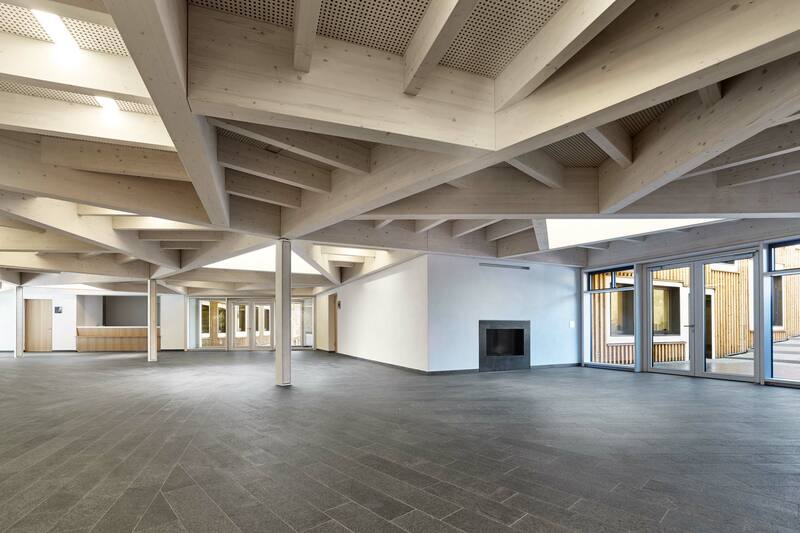 The research campus of the Fraunhofer Institute for Integrated Circuits IIS was built at the edge of the medieval city of Waischenfeld in the idyllic landscape of northern Bavaria. One of the houses is equipped with conference rooms for seminars. The other three are structured horizontally in offices and laboratories on the ground floors and guest rooms on the upper levels. The building parts are connected centrally by a flat-roofed timber truss-work, which encloses the central event space punctuated by triangular skylights providing an all-weather connection. The close connection of living and working in this secluded area creates a focused, yet communicative atmosphere in which project teams can meet, work and do research while sharing an intensive exchange. The building targets at sustainable construction and operation with low energy demand and emissions. The differently utilized areas have different construction methods: To protect them against the earth the lower levels are made of concrete and are partly pushed into the ground. The thermal mass of the concrete provides good indoor climate, insulates against summer heat and acts as an acoustic barrier. The visible areas of the massive building parts have hammered concrete furring. 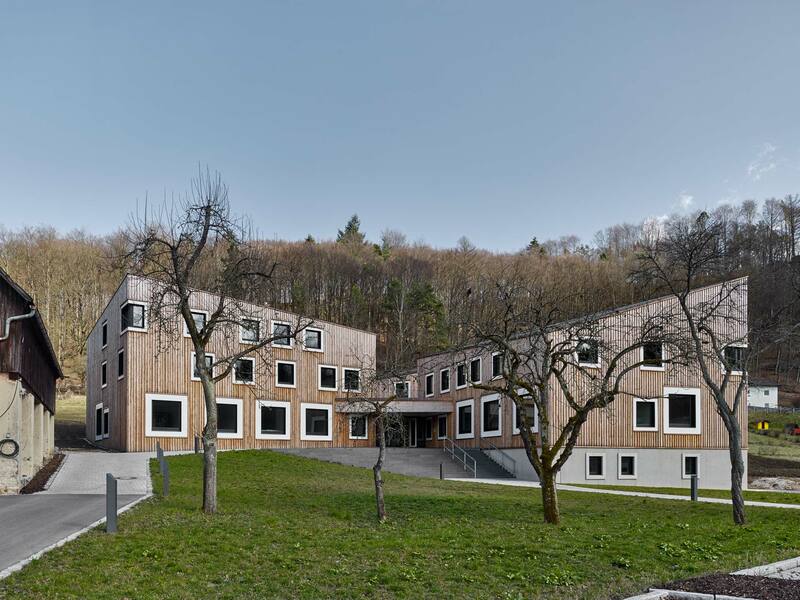 The upper storeys were built in timber frame construction of prefabricated wall elements and are cladded with an untreated larch wood. The roof coverings are made of untreated copper sheets. 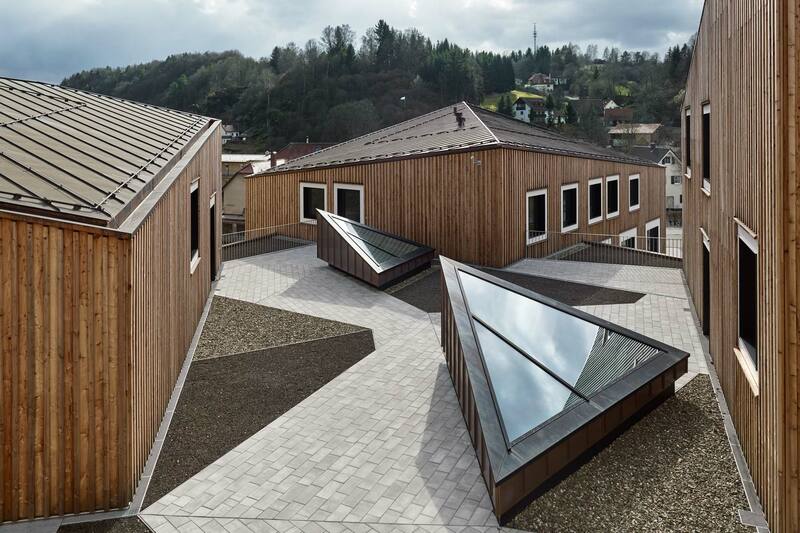 In total the building envelope of the research center achieves passive house standard. The apartments are have operable windows; the seminar areas are mechanically ventilated using heat recovery in winter. The lobby area, equipped with radiant floors, can be naturally cross ventilated in the summer and thus remains comfortable even in warmer months. A biomass pellet boiler supplies heat efficiently regarding primary energy consumption, with an additional condensing gas boiler to cover peak loads. Compared to a conventional heating this approach saves about 80% of CO2 emissions.